A substance found in crab shells is the key component in a nanoscale sensor system developed by researchers at the University of Maryland's A. James Clark School of Engineering. The sensor can detect minute quantities of explosives, bioagents, chemicals, and other dangerous materials in air and water, potentially leading to security and safety innovations for airports, hospitals, and other public locations. 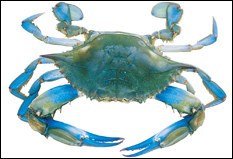 Clark School engineers are using a substance called chitosan (pronounced "kite-o-san"), found in the shells of the Chesapeake Bay's famous blue crab, to coat components of the microscopic sensor system. Crab lovers can hold on to their mallets-the crabs do not need to be harvested specifically for this purpose. The material is extracted from the crab shell waste. Reza Ghodssi, associate professor in the Clark School's Department of Electrical and Computer Engineering and the Institute for Systems Research (ISR), and a member of the Maryland NanoCenter, is one of the investigators leading the project. He is joined by a multidisciplinary group: Gary Rubloff from ISR and the NanoCenter, Bill Bentley from the Fischell Department of Bioengineering and Greg Payne from the University of Maryland Biotechnology Institute (UMBI). "Chitosan is interesting because it's a biological compound that can interact with a wide variety of substances, and also work well in a complex, sensitive device," Ghodssi says. Ghodssi's graduate students, Nathan Siwak, Stephan Koev, Jonathan McGee and Mike Fan, are helping to develop the nanoscale "system on a chip." It employs multiple miniature vibrating cantilevers, similar to diving boards, which are coated with chitosan, plus optical sensing technology that can see when the cantilevers' vibrations change (such devices are called micro-electro-mechanical systems or MEMS). Different cantilevers can detect different substances and concentrations. When a targeted substance enters the device from the air or water, the chitosan on a specific cantilever interacts with the substance and causes that cantilever's vibration to change its characteristics. The optical sensing system sees the vibration change and indicates that the substance has been detected. Ghodssi and his collaborators have recently submitted a proposal to the National Institutes of Health (NIH) to develop a sensor system to detect the presence of avian flu. The technology was developed and initially tested at the Laboratory for Physical Sciences (LPS) in College Park, Md., and it is currently sponsored by LPS and the National Science Foundation (NSF). "This is an exciting and complex microsystem that bridges biotechnology and nanotechnology to address critical needs of homeland security applications. My colleagues and I are expecting this work to become a product in the near future," says Ghodssi, who has to date filed for six patents on the technology. Parts of this research were recently featured in the Journal of Micromechanics & Microengineering in April 2006 and the journal Biomacromolecules in November 2005. For more information, please see the Clark School press release on this research. "This is an exciting and complex microsystem that bridges biotechnology and nanotechnology to address critical needs of homeland security applications."